Treadwell believes that the Fibreglass Reinforced Plastic (FRP) industry is poised for unprecedented progression into new and uncharted waters, where its growing list of benefits will secure a return on investment previously unattainable by homogeneous products or metal options and leave a smaller footprint on our environment. Beginning our roots in the 1990s, Treadwell has been applying excellence in engineering and design to extend time and cost savings to our clients across an extensive scope of industries and markets. 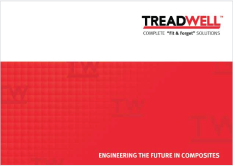 Treadwell now offers complete strutural and walkway turnkey solutions which are present in water and waste water treatment, public infrastructure, marine and shipping, and mining and minerals sectors to name a few. Constantly reviewing and improving ourselves to maintain our lead of the pack in the FRP industry, we continually provide our clients with novel solutions made from the latest FRP innovations. We are committed to helping you avoid the unnecessary challenges that are caused by more primitive alternatives. With this level of commitment, we actively seek to discover more strategies at how our FRP products and systems can be applied to save you time and cost to remain ‘Innovators in FRP Technology’. Treadwell still seeks a strong culture of originality and ingenuity so that we can provide the complete ‘fit & forget’ solution anywhere.